Does your mom use power tools? Does she ask to borrow yours? Mother's Day is less than 10 days away and is coming upon us fast, so why not buy her a drill of her very own? Skil makes one in pink, so she will automatically love it. Sure you could by her flowers, but for the same price or less you could get the Skil IXO 4-volt compact driver kit—something that is actually useful. It is small enough to fit in a craft box or drawer, yet still has enough power to do many tasks around the house. 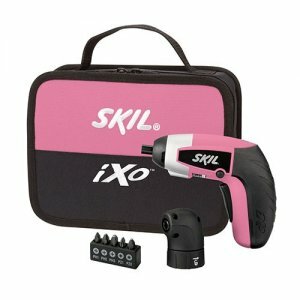 The Pink Skil IXO cost under $40 and comes with accessories to help her get started on her projects. Included in the kit is the driver, a right angle attachment, a 5-piece bit set, charger and a case.